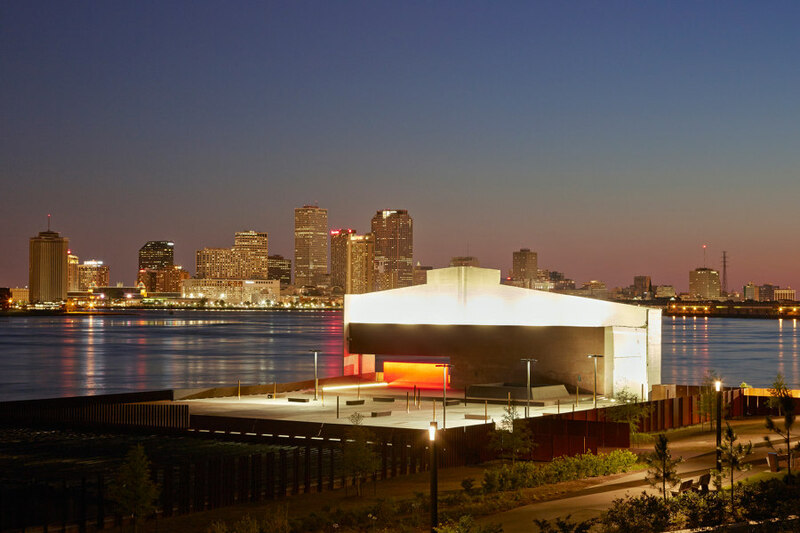 The project was sparked by Hurricane Katrina as an unprecedented opportunity to reevaluate a languishing stretch of waterfront and to supplement New Orleans’ unique character, unusual street grid, and historic architecture with visionary yet practical and contemporary sustainable design. 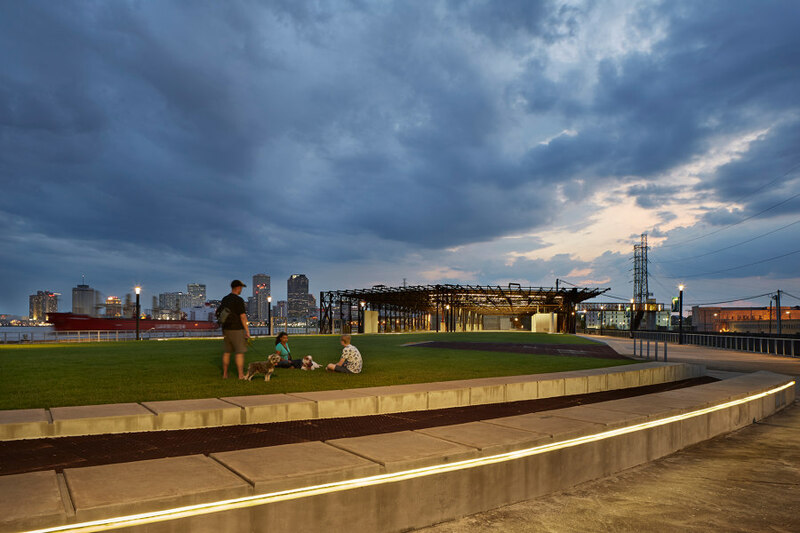 As the first new riverfront park in New Orleans in 30 years, Crescent Park is a response to the need for the city to reclaim its sense of place and origin… a return to the river. 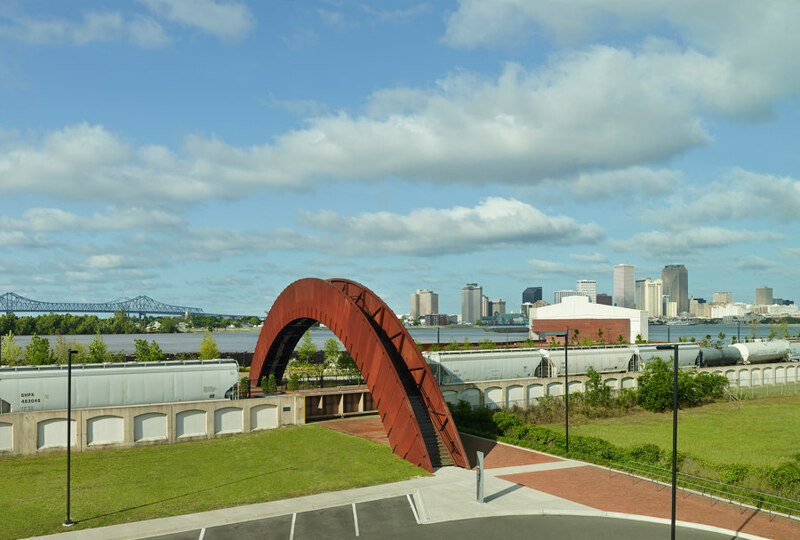 This 1.4-mile linear park repurposes a maritime/industrial brownfield into 20-acres of indigenous landscaping, a network of paths suitable for walking, jogging, and biking; picnic areas, a dog park, and the adaptive reuse of two industrial wharves: the Piety Wharf and Mandeville Shed. 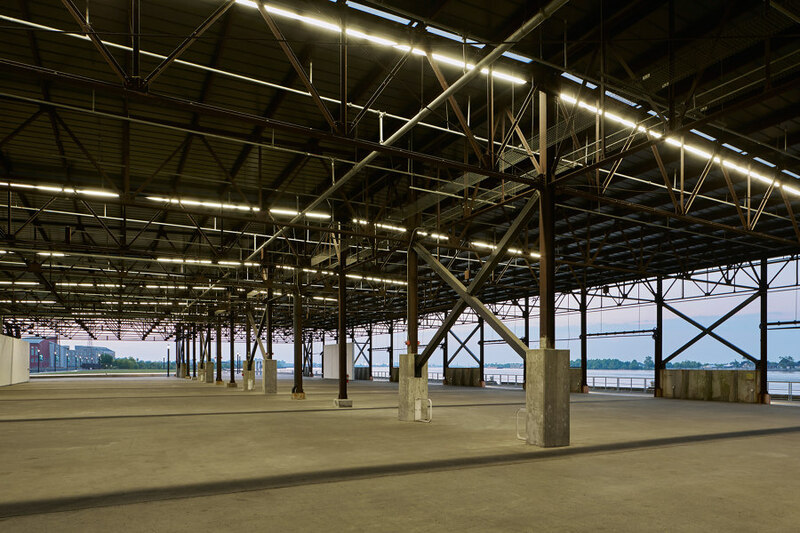 Both structures have been stabilized and repurposed to accommodate public gatherings, festivals and the host of artistic exhibitions that take place throughout the year. 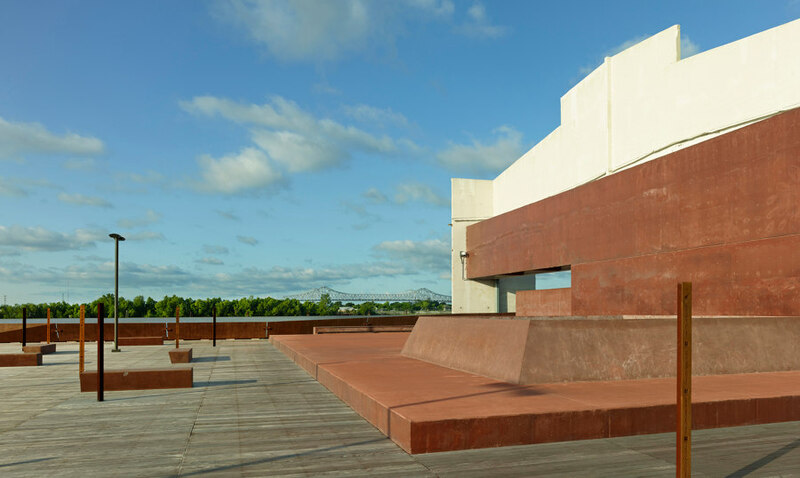 In lieu of new construction, the architects made a conscious decision to build upon the layers of history and character that already defined the sight. 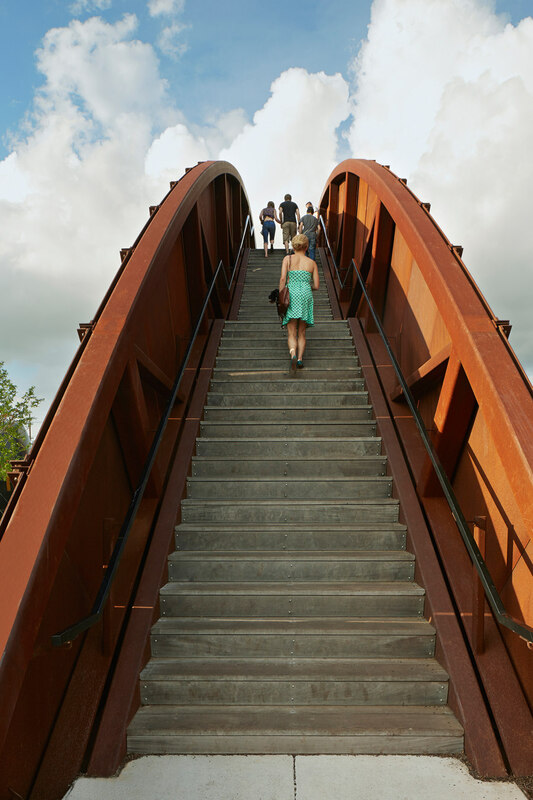 Evoking a palimpsest, the park is a delicate balance of layering old and new. 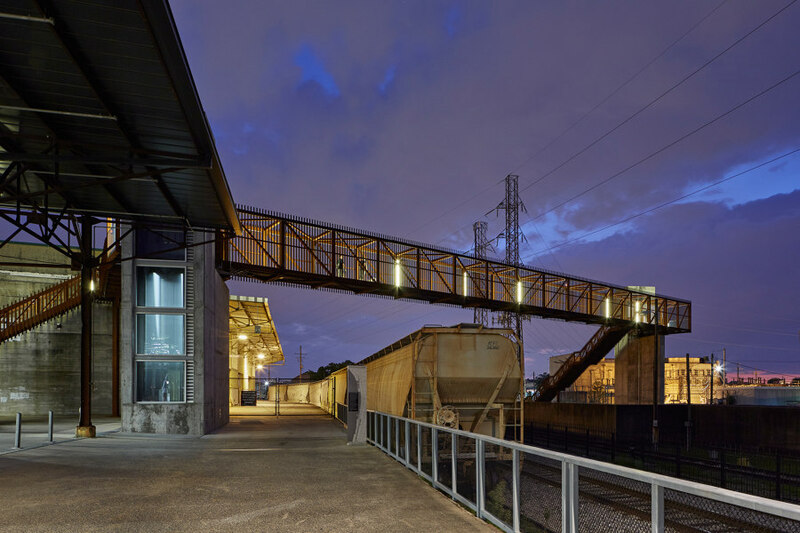 Rather than eradicate the history of the site, the design team chose to celebrate and build upon it without compromising the allure and poetic ruin of post-industrialization decay and flood infrastructure that ultimately characterizes this part of the city. For example: Inscribed lines of the defunct railroad tracks are the foundation of all the pathways in the park. 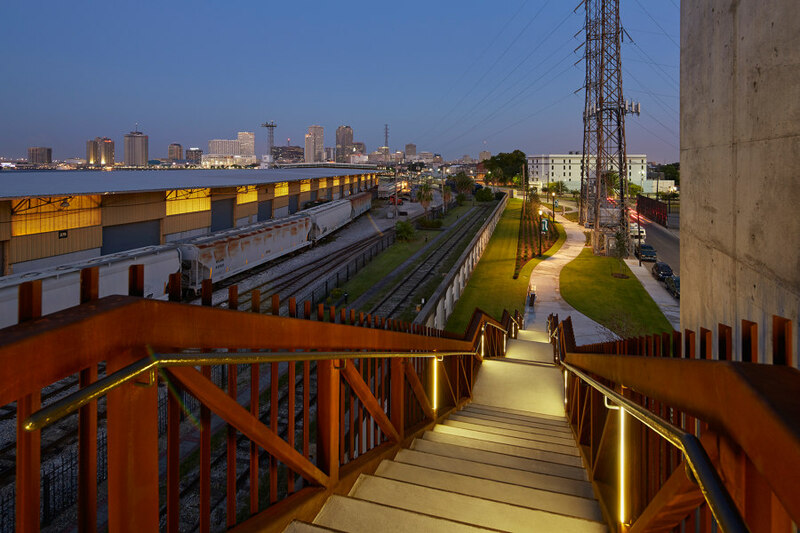 Though still separated from the Marigny and Bywater neighborhoods via an active rail corridor and flood wall, the site identifies the intersections of the main promenade with the historic street grid. Each intersection is highlighted by a large slab of concrete bearing the street name. 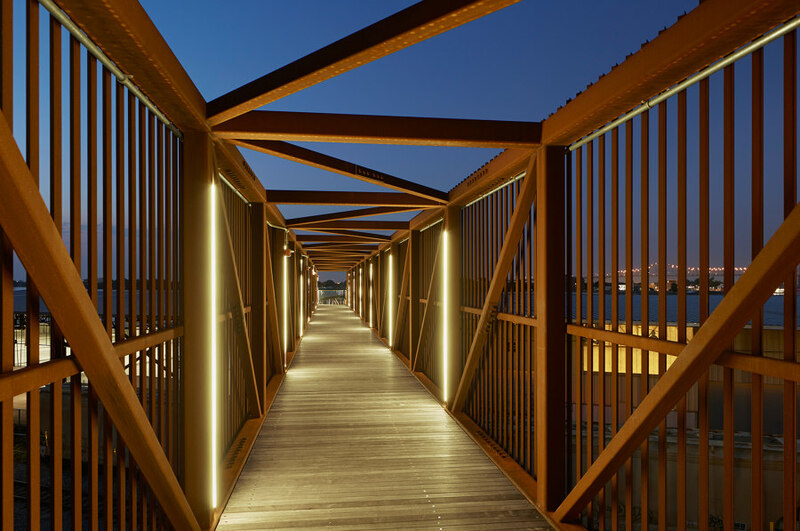 This acts as a means of wayfinding and orientation while inviting visitors to sit and enjoy their surroundings. 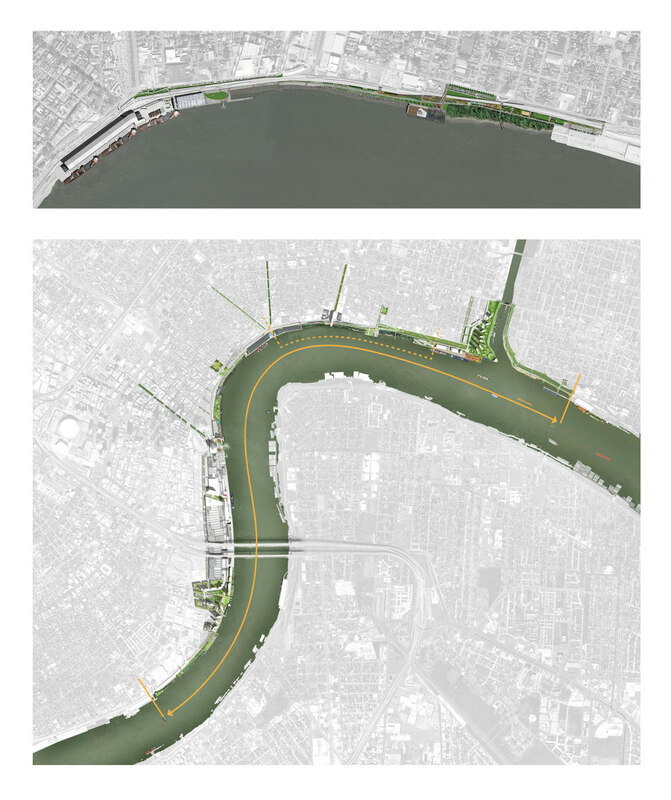 The original riverfront development plan, completed in 2007, proposes a key role for a six-mile stretch along the East Bank of the Mississippi River. From Jackson Avenue upriver to the former Holy Cross school site just down river of the mouth of the Industrial Canal, this plan envisions an urban, active, beautiful river crescent for the city’s citizens to enjoy. The first phase to be implemented from this plan is Crescent Park. 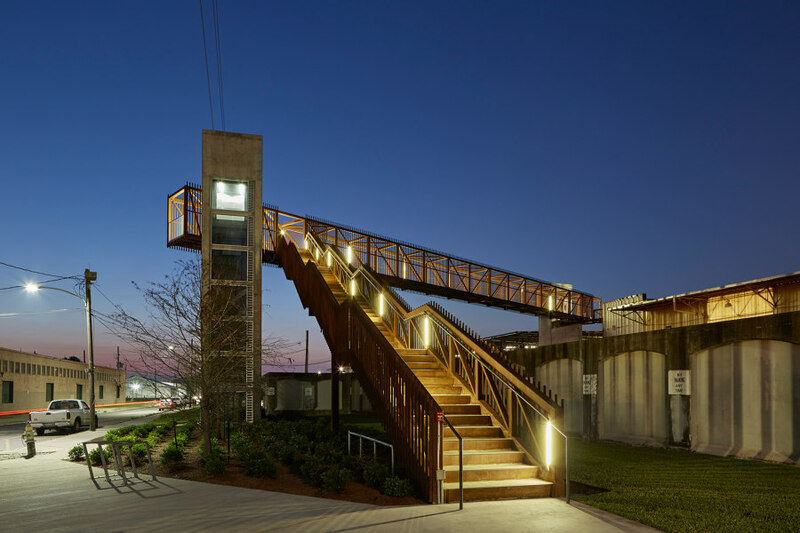 It grants unparalleled physical and visual access to the river, creating an environment for locals and visitors to interact and enjoy the essence of New Orleans. 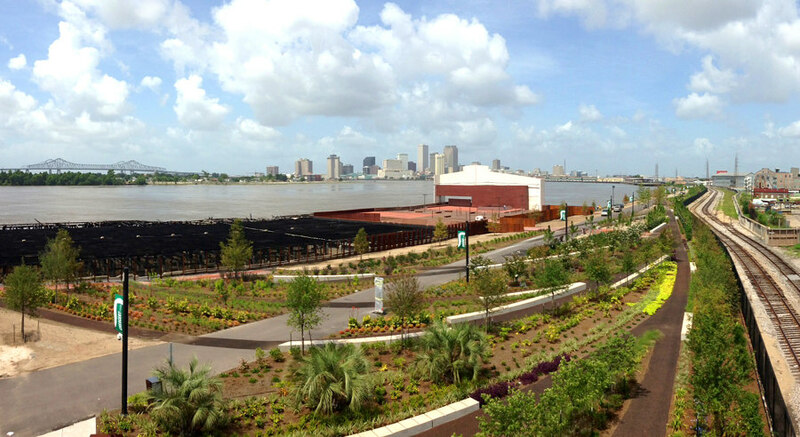 A diversity of landscapes coexists within the footprint of the riverfront. Within the master plan development, expansive public parks anchor opposite ends of the project, while smaller, neighborhood-oriented parks are periodically inserted along the project’s length. These parks contain a range of destinations such as wetlands, sun decks, amphitheaters, tennis courts and cafes. 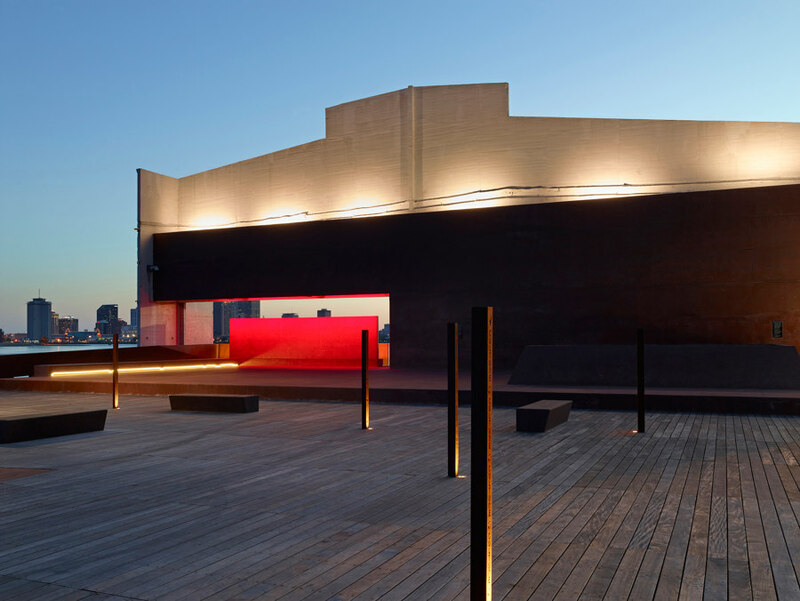 Urban plazas are strategically located at major intersections to celebrate the city’s cultural history while also creating energetic new spaces amidst new development. 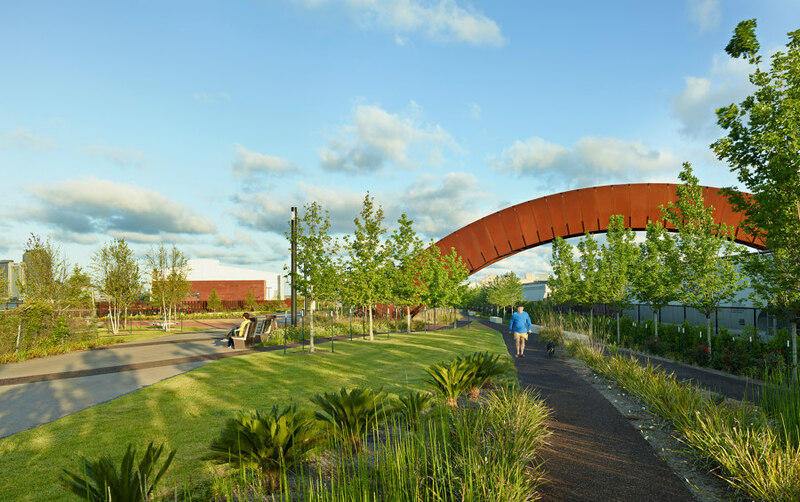 Sustainable streetscapes and paths provide efficient circulation, and a series of pedestrian piers and bridges carry people over flood walls and train tracks to ultimately gaze over the Mississippi River itself. 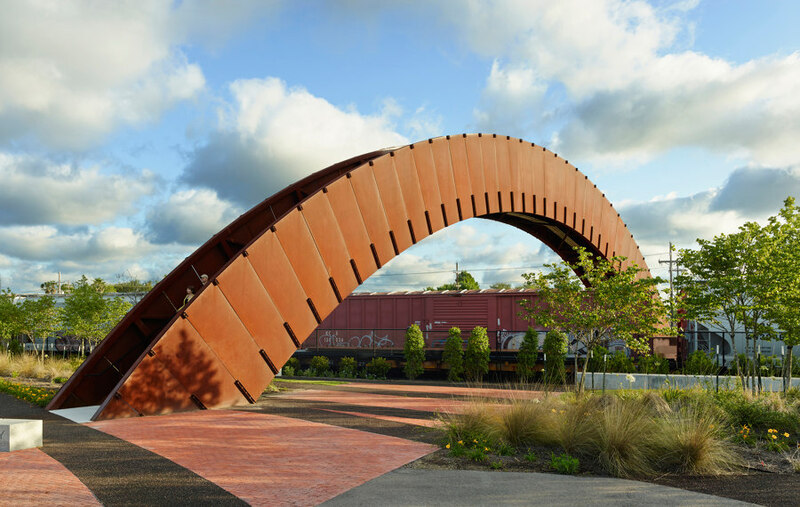 Throughout the creation of the development plan and the design of Crescent Park, the design team engaged the community at three different levels. The Steering Committee and the Stakeholders Group are comprised of individuals who represent those parties with direct interests and expertise in the redevelopment of the riverfront. The public was invited to more than a dozen forums where the design team presented and received comments. The team also accepted the invitations of many neighborhood groups and citizens to present in various public meetings. Following the public presentation of the final draft, the design received a standing ovation. Ensuring the transparency and accessibility, the entire public process was made available on the project website. This website also served as a history of the design development. 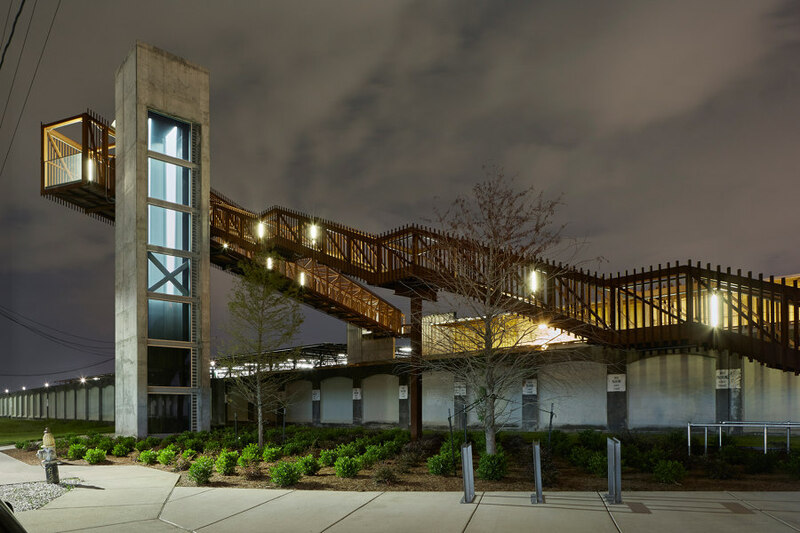 Improvements to the existing Piety Wharf, a centerpiece of Crescent Park, expand space for neighborhood gatherings, and offer residents the opportunity to commune with nature at the river’s edge. Nestled between two patches of restored batture, a wider strip of land at the foot of the corresponding street allowed for facilities to be built, and for parking serving residents who live further away. A narrow strip between box levee and rail tracks widens from five feet to thirty feet, moving downriver, allowing for a linear park of “boxcar hedges,” vegetation planted in orthogonal bands matching the scale of the adjacent railroad container cars. Grouping the vegetation bands at boxcar scale blurs the relationship of active freight to the river, while maintaining the industrial scale of the continuing activity of the rail activity. The bands of vegetation are periodically bisected by the figurative extension of the street grid to the river, physically expressed as a contrasting paving material and species, as the flood wall cannot be punctured. This extension of the street grid doubles as wayfinding for park visitors. Railroad spurs once peeled off from the main line in tight arcs, with multiple spurs arriving at each wharf. Traces of the spurs remain, with curving bands of ballast and iron rail intermittently visible. 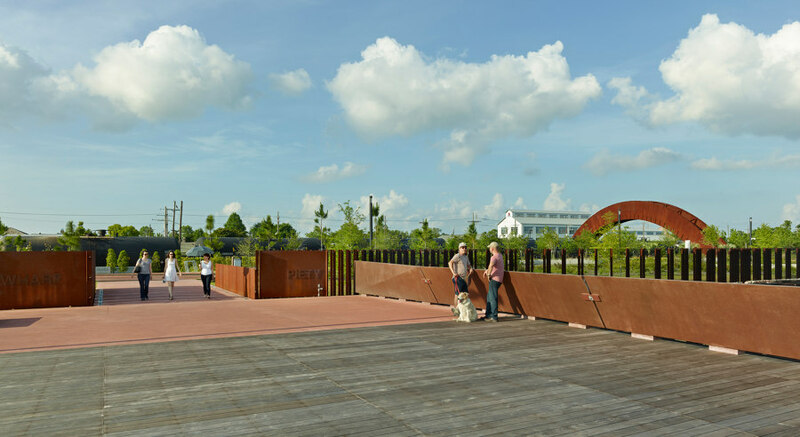 The 1,200-foot-long gardens draw on this complex of spurs as the generator for pedestrian paths framing a series of converging garden plots containing primarily native vegetation species. The gardens offer a diversion from the main pedestrian promenade, with smaller paths and opportunities for lingering. The park is first and foremost about connection: reconnecting neighbors to the river they live so tantalizingly close to, but have long been denied access to this riverfront landscape: free of vehicles, and now, largely free of structures. 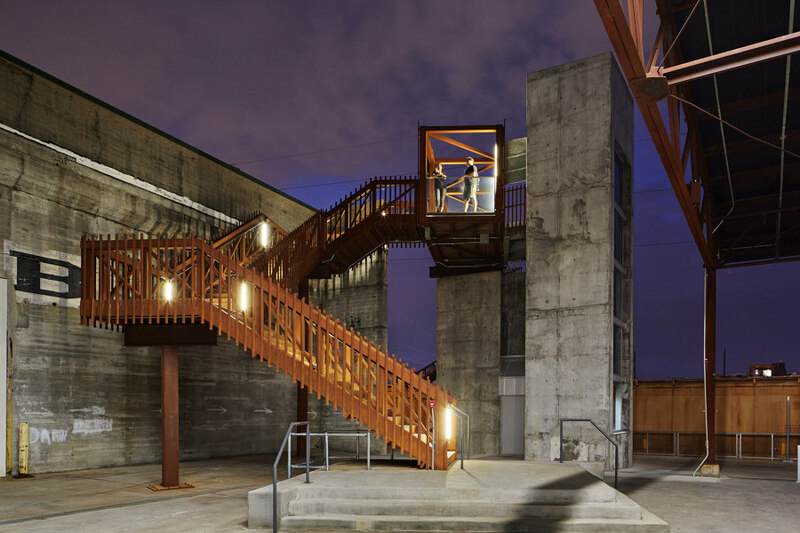 Given the impracticality and cost of taking on the river control structures, the team focused their efforts on making the coarse, post-industrial maritime landscape accessible to pedestrians without scrubbing away the patina of past heavy commercial port use. Native landscape far outweighs the area given to grass lawn, continuing the ever-increasing growth of vegetation over the decaying port structures and promoting a more sustainable landscape approach.